The Ruelco Self Relieving High Pressure Regulator is a rapid response regulator designed to provide precise flow pressure control of a high pressure inlet signal. The self relieving regulator allows the operator to lower downstream pressure simply by turning the knob, and automatically venting off excess downstream pressure, regardless of the flow conditions. 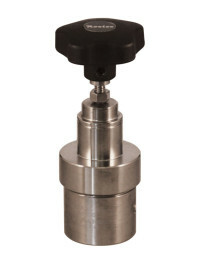 The valve also comes standard with a 20 micron stainless steel filter to ensure long life and clean downstream flow. due to supply system debris.